“Courage,” Ella Baker said, in 1931, to a phalanx of young African American co-operators gathered in Pittsburgh. They had come from across the country to organize for a radically democratic society – based on solidarity and justice – and to inspire their communities with a vision of a Black commonwealth. 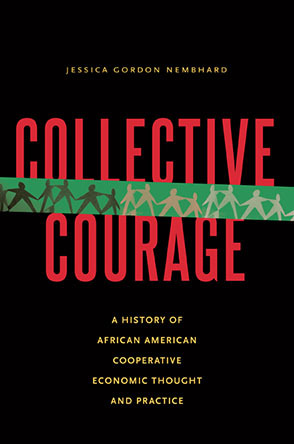 Baker continued, “Each successful Co-Operative enterprise has taken much time and energy and sacrifice to establish.” Here we have a thread – courage and hard work – that Jessica Gordon Nembhard follows in her fascinating history of African American cooperatives, Collective Courage. These were cooperatives organized despite racist repression (sometimes violent), federal discrimination (a drain on resources to fight) and little (does it need to be said?) financial support. Gordon Nembhard, a political economist by training, took up the historian’s trade and delved into archives and tracked down original sources to uncover the untold story of Black economic self-help. This was not the path she expected to take after her research convinced her that if communities organized cooperatives they would both create and retain local wealth. That realization led her to explore African Americans’ historic involvement with cooperatives. The problem, though, was that there wasn’t a history to turn to. Its place on the library shelf was vacant. She had to write the book. Order the book from Penn State University Press (use the code JGN14 at checkout to receive a 20% discount).